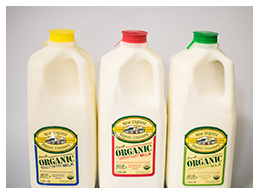 Since 1908, family run Shaw Farm has been providing high quality local dairy products to the Merrimack Valley. Visit our Farm Store, open all year, where we carry wide variety of high quality local products including our own farm fresh milk, ice cream, and dairy products. We also offer fresh produce, baked goods, prepared foods, and so much more! Stop by and see what we are selling today! Many people remember the days when Milkmen delivered to your home. We still do! Check out our Home Delivery page to order fresh farm products delivered to your door.